A Party Ball breaks open releasing various items in Super Smash Bros. Brawl. For the CPU Mode, see ITEM. An item is an object, that either randomly appears on-stage during a match or is summoned by a character's special move, that can be picked up and used by characters. Many items can be wielded once picked up, while others apply an effect, and almost all can be thrown at opponents. Items are a large part of the gameplay of the Super Smash Bros. series, but problems with randomness and inconsistent risk/reward balance results in tournament rulesets universally requiring that random spawning of items be disabled using the Item Switch before starting the match. Items appear from stage-dependent designated locations at various times throughout a match based on the frequency set in the Item Switch. 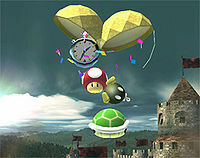 Characters can pick up items by standing near one and pressing the attack button; items (except Crates, Barrels, Barrel Cannons, Rolling Crates, and Grass) can also be grabbed in midair starting in Melee with the grab button, or grabbed during dashes and aerial attacks in Brawl and SSB4. Characters can only hold one item at a time (if Villager's Pocket ability is discounted). If an item is left alone, it will eventually disappear, flashing briefly beforehand (Pitfalls, Green Shells and Ore Clubs being exceptions). Items that are picked up by characters can be dropped or thrown with the grab button, and they may be dropped if the character takes a hard hit. The damage done by a thrown item depends on how fast it's moving. Most items can also be swallowed in Brawl and SSB4, and in the latter, can even heal these characters when they do so, unless the item is an explosive. In SSB64, items (except for Super Stars) have a small triangular indicator above them. This feature was dropped in Melee and reintroduced in SSB4 (Food and Smash Balls also do not have the indicator). In Super Smash Bros. and Super Smash Bros. Melee, the chance of a character dropping their held item when hit is (hitbox damage)/60. Thus, if a hit deals 6% damage, the chance of it causing an item drop on a given frame is 10%. Roy’s fully charged Flare Blade in Melee deals 50 damage, so it has a drop chance of 83.333%. In Brawl and Smash 4, this probability was decreased; normal items now use the formula CEIL(hitbox damage)/70. In addition, certain non-standard items use different formulas. In Brawl, this includes Dragoon pieces and the Smash Ball, where the drop chance = INT(hitbox damage)/50. In Smash 4, the chance of dropping each Dragoon piece was decreased to INT(hitbox damage)/100. This formula also applies to the Daybreak. The Master Ball item also has a non-standard drop chance, but the formula is not known. Items can be grouped into several categories based on their effects. Container items release other items once broken open, which can be done either by attacking them or by picking up and throwing them. In general, container items have a 12.5% (1 in 8) chance of exploding instead of releasing items. Battering items are wielded by characters once picked up, turning their neutral attack, forward tilt, dash attack, and forward smash into an item swipe. Shooting items fire projectiles when used, typically replacing the neutral attack and neutral aerial of the user. They all have limited ammunition and will merely shoot blanks once it runs out. In SSB4, trying to shoot an empty item will instead simply throw it. Throwing items can only be thrown at opponents. Holding a throwing item means that a character cannot use most of their attacks, as pressing the attack button will simply throw the item. Status items apply some sort of effect to the user, often beneficial but not necessarily. Some status items only need contact to be used (instead of needing to be grabbed). The ones that do need to be grabbed can be picked up even if the character is already holding an item; no such items exist in the original Super Smash Bros.
Recovery items decrease the damage of the user (or increase their HP in Stamina mode). Starting in Melee, recovery items can be picked up even when the character is already holding an item. Summoning items release an ally that fights along side you or your team when picked up. Collectible items do not affect the match, but instead are added to the player's collection once picked up. They can be picked up even if the character is already holding an item. Computer players will not attempt to pick up collectible items, but if they do so accidentally they will not count. Special items do not fit into the above categories. In addition to the above, certain items can be heavy, which limits those that pick them up into walking slowly (or not at all in SSB) and throwing. Only Donkey Kong can move quickly or jump while carrying a heavy item. These items are available in the item switch menu. Some items like containers are grouped together, but the player can toggle all of these items on or off. Assist Trophy Summoning When picked up, after the character lands on the ground, they will perform a short animation and summon a random character to aid them in the fight. Super Smash Bros.
Banana Gun Shooting Ejects the banana out of the peel and the player is left with the banana peel after using it. Super Smash Bros.
Barrel Container Once thrown, struck, or landed on a slope, may roll across the stage and damage what it hits before breaking. Has a one-in-eight chance of exploding. Super Smash Bros.
Beam Sword Battering Starting in Melee, gets longer when swung depending on character. Peach has a rare chance of plucking one when using Vegetable. Super Smash Bros.
Beastball Throwing Reappears near an opponent after being thrown and targets them, covered in flames. Super Smash Bros.
Black Hole Throwing Creates a massive black hole, dragging all items and players nearby in. Throws the opposite side of user's orientation. Super Smash Bros. Blast Box Throwing Very poor throwing distance. Explodes upon taking 30% damage or a flame attack. Super Smash Bros.
Bumper Throwing Can be placed on the stage or (in Brawl) set in midair, where it will knock away characters that touch it. If two or more are present, they can be used to momentarily trap characters by bouncing them back and forth. Super Smash Bros. Capsule Container Contains a single item. Has a one-in-eight chance of exploding. Super Smash Bros.
Cracker Launcher Shooting Limits the user to walking and a single jump, and automatically dropped from any flinch. Super Smash Bros.
Crate Container Contains many items. Has a one-in-eight chance of exploding when thrown, or hit with enough force to break. Super Smash Bros. Drill Arm Shooting Allows the wearer to fire a large drill. Super Smash Bros. Fake Smash Ball Special Flies around the stage, similar to the Smash Ball. Characters can break it in order to activate. Once broken, it will explode. Super Smash Bros. Fan Battering Fastest-swinging battering item. High shield damage. Super Smash Bros.
Food Recovery Each type of food recovers a different amount of damage. Can be produced in large numbers by Peach Blossom. Super Smash Bros.
Gooey Bomb Throwing When thrown, attaches to characters and can transfer to other characters that pass by. Explodes after a certain time or if attacked when not on a character. Super Smash Bros.
Healing Field Throwing/Recovery Can be thrown on the ground. Once thrown, it will open up and will heal anyone standing on it. Super Smash Bros.
Healing Sprout Throwing/Recovery Sticks to fighters and gradually heals them. Can be transferred on contact like the Gooey Bomb. Super Smash Bros.
Home-Run Bat Battering An extremely powerful item. Its forward smash is among the most powerful attacks in all four games, being a one-hit KO in every one. As a throwing item, it maintains its high knockback and is a semi-spike. In Brawl, forward smash uses a unique animation. It becomes stronger when hit on the tip. Super Smash Bros.
Motion-Sensor Bomb Throwing Attaches to the stage once thrown; characters that approach it after a short time cause it to explode. Super Smash Bros.
Party Ball Container Once activated by being thrown or damaged, it floats into the air and opens, dropping its items. Super Smash Bros. Rage Blaster Shooting Fires a blast of energy. The higher the percent a user has, the more damage it does Super Smash Bros.
Ray Gun Shooting Fires blasts of energy that have infinite horizontal range. Super Smash Bros.
Rolling Crate Container When thrown, struck, or lands on a hill, will roll across the stage and damage what it hits without breaking. Can be stood on. Super Smash Bros.
Sandbag * Special When attacked, produces items. Super Smash Bros. Smash Ball Special Flies around the stage. Characters must break in order to obtain. Once broken, player presses their neutral special button to use their Final Smash. Will fly off-stage after a short period if not obtained and used. Super Smash Bros. Smoke Ball Throwing Once thrown, spews smoke around its immediate area. May stick to opponents. Super Smash Bros. Team Healer Throwing/Recovery Heals teammates when thrown at them. When thrown at opponents, can heal or damage them at random. Only appears during team battles. Super Smash Bros.
Timer Status Slows down all opponents. Can backfire and slow down the user, or slow down the entire game. Super Smash Bros. These items are still available in matches, but never have any feature to turn them on or off. If items are turned on, they all can appear in the games they're in regardless of characters being used, the stage, or presense of other items. CD Collectible Unlocks a random piece of stage music when picked up. Disappears extremely quickly. Will stop appearing in game after all music is unlocked. Super Smash Bros. Custom Part Collectible Adds customizable parts for characters. Super Smash Bros. Sticker Collectible Adds to the player's sticker collection. Super Smash Bros.
Trophy Collectible Adds to the player's trophy collection. Super Smash Bros. Items found in the table below are exclusive to character(s), stage, presense of other items, or match rules. Some of them may be impossible to obtain in normal matches without hacking, and require the player to play another gamemode to find them. Auroros Throwing Only appear in the Subspace Emissary. When Auroros dive and miss, they can be picked up and thrown at other enemies. Super Smash Bros. Egg Container Produced by Chansey, Birdo and Yoshi series stages. Essentially identical to Capsules. Super Smash Bros.
Gyro Throwing Produced by R.O.B. 's down special move. Lingers on the ground and damages opponents who touch it while it spins. R.O.B. Key Throwing Only appears in specific Subspace Emissary stages. Unlocks doors when thrown at them or the holding character touches them. Returns to original spot if it remains idle on the ground. Super Smash Bros. Smash Coins and Bills Collectible Only appear in coin battles. Adds to player's coin count. Bills first appeared in Brawl, supplementing coins. Super Smash Bros.
Stat Boost Status Boosts the status of the character. Only appears in Smash Run and Smash Tour. Super Smash Bros.
Stock Ball Special Only appears in specific Subspace Emissary stages at lower difficulties. Adds one stock to the player's total. Super Smash Bros.
Trophy Stand Throwing Only appears in the Subspace Emissary. Causes weak or low-health enemies to turn into trophies; merely damages strong and healthy enemies. Super Smash Bros.
* Appears in Smash games but not as an item. ** Appears in Smash games but as a stage hazard. Only appears in Super Smash Bros for Nintendo 3DS. Only appears in Super Smash Bros for Wii U. If all recovery items are turned off in Super Smash Bros. Melee, the chance of naturally occurring items like the apples dropped by Whispy Woods on Green Greens and Chansey's eggs recovering health is eliminated; the apples will all be projectiles and the eggs will either be explosives or drop other items. In Super Smash Bros. Brawl the same is true regarding the apples (since Chansey does not appear). Additionally, the vegetables on Summit will not appear if food is turned off. This page was last edited on April 1, 2019, at 17:20.